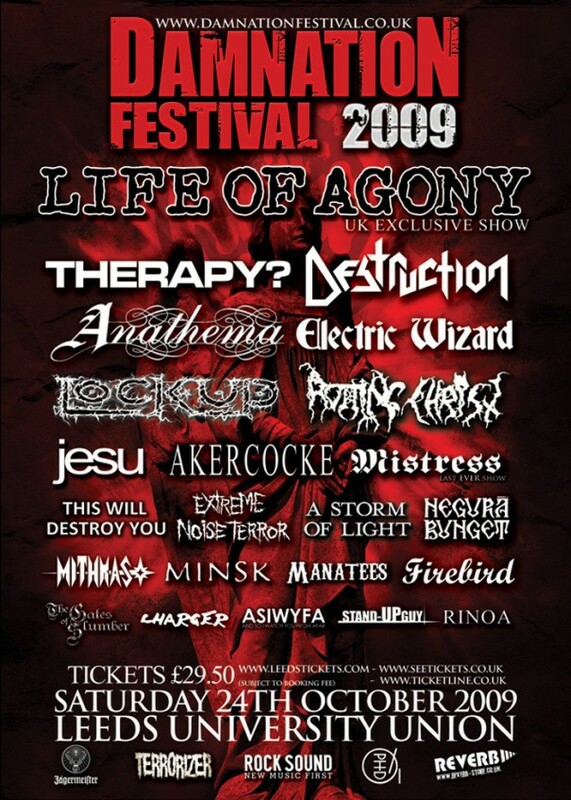 Damnation Festival – voted the UK’s best metal event in 2008 – returns to Leeds on Saturday, October 24, 2009 promising to deliver its finest chapter yet. Damnation Festival 2009 will take place on Saturday, October 24 at Leeds University Union, across three stages with doors opening at the earlier time of 1pm through until 3am. Grindcore supergroup LOCK UP will headline this year’s Terrorizer Stage in what will be their only show of 2009 and likely the band’s last ever live appearance. The almost mythical extreme metal behemoth – which will feature At The Gates frontman Tomas Lindberg, Anton Resisenegger of Pentagram and Criminal on guitar, Napalm Death bassist Shane Embury and ex-Dimmu Borgir and Testament drummer Nick Barker – will perform live in the UK for the first time in almost ten years. DAMNATION FESTIVAL is the product of a group of disillusioned fans fed up with watered down pop-rock taking the place of home-grown heavy metal talent on stages across the UK – we aim to address the balance. You’ll often hear us banging the drum that this is an event “for the fans, by the fans” – but it can’t be put any simpler than that. No suits behind the scenes, no money making master-plan and no agenda other than to host a festival bill worth stripping to the waist and rubbing against sweaty headbangers for!